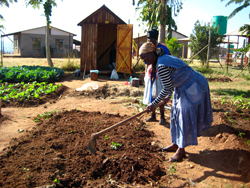 A Grannie works in the community garden at a Care Center in Masoyi, South Africa.With an estimated 5.5 million people living with HIV in South Africa, the AIDS epidemic is creating large numbers of children growing up without adult protection, nurturing, or financial support. Of South Africa’s 18 million children, nearly 21% (about 3.8 million children) have lost one or both parents. Despite the magnitude and dire consequences of the growing number of orphans and vulnerable children (OVC) in South Africa and elsewhere in sub-Saharan Africa, there is insufficient documentation of the strategies deployed to improve the well-being of these children. To fill these knowledge gaps, the U.S. President’s Emergency Plan for AIDS Relief commissioned Khulisa Management Services of Johannesburg, South Africa, to research and write case studies of 32 OVC programmes in South Africa that receive emergency plan funding. Hands at Work’s Masoyi Home-Based Care project serves Masoyi, consisting of six villages in Mpumalanga Province. Here is the case study of what we do and how we do it.